This bowl is so awesome, I really want to keep it for myself but it is going home with one of YOU. 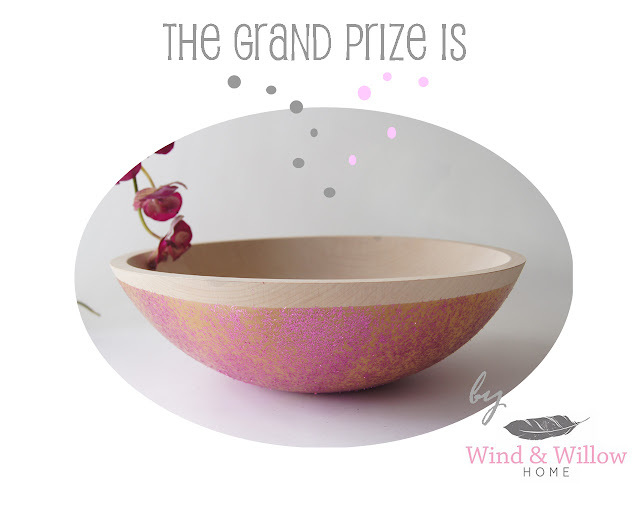 This bowl is huge, 15" diameter made of Solid beech wood and adorned with pink tinsel glitter imbedded in a soft clear rubber (it is truly one of my favorite bowl that I have ever made) retail price $125. Perfect for the Kitchen, Bedroom, Livingroom or anywhere you need a little extra sparkle. If you have already pinned your favorite item from Wind & Willow Home or become a new friend on Facebook, Twitter or signed up for our Newsletter (and let us know about it in the comments) you are already entered to win. If not, find out how to enter here. I have extended the contest through the weekend (you have until 11:59 pm Sunday CST) since I have been getting lots of curiosity about the Grand Prize. I will announce the grand prize winner right HERE Monday. This is the most beautiful bowl!! I think you've absolutely outdone yourself (: Thanks for a fun week of surprises! !